It’s been one year since Hurricane Maria made landfall on Puerto Rico. US travelers hesitant to go there fall into one of two camps: people who vaguely believe that half the island is still underwater, and people who worry that they’d be an unwelcome resource drain on a fragile economy. It can absolutely in no way be overstated that neither of these things are true. You aren’t burdening Puerto Ricans with your beach vacation: On the contrary, when you visit Puerto Rico, you’re putting money in the pockets of Puerto Ricans directly, immediately, which is more than can be said of pretty much any major relief organization. The vast majority of the island has reopened for business. Hotels are open. Restaurants are open. Also, flights are mad cheap right now. Also also, there are tons of things to do and it’s fun, and you are a person who enjoys fun. 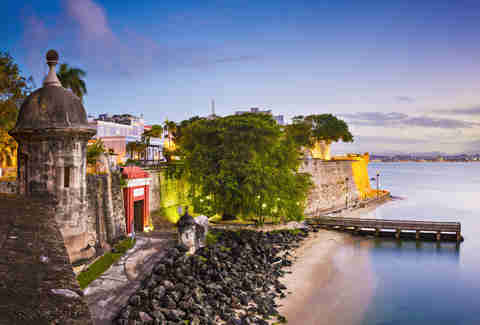 Puerto Rico is extraordinary, as I found out from the four days I just spent in and around San Juan. Here’s everything you need to know to plan your visit. First up, do Americans need a passport to go to Puerto Rico? Nope, no passport required. It’s the same ‘ol dollar, and a jaunty 2 1/2-hour flight from Miami. Is now really the best time to go? Isn’t it hurricane season? Indeed it is. But it’s important to understand that hurricane “season” is basically half the year -- officially, June 1 through November 30. 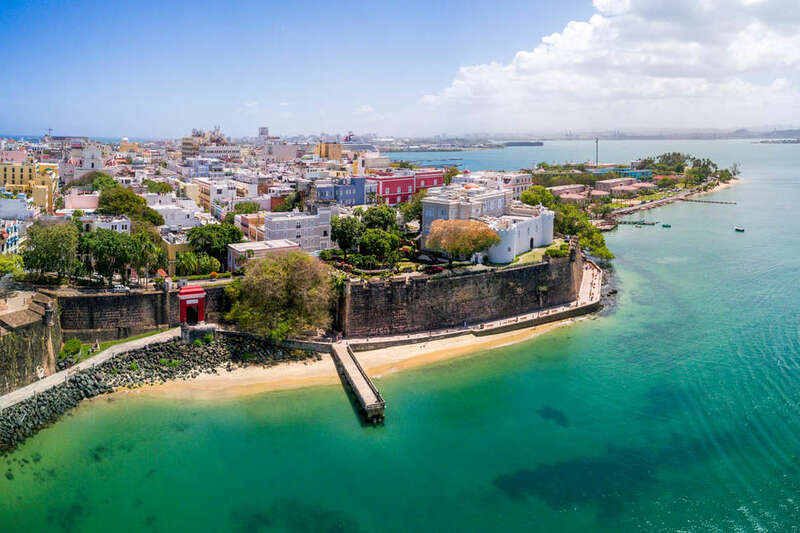 By October or November, things are drying out again, and so autumn can actually be one of the best times to visit Puerto Rico. After Labor Day, flight and hotel prices drop off steeply from where they were during the summer high season -- which, remember folks, was technically hurricane season, too. The forecast for this season is expected to be quite light on hurricanes, but of course check the weather predictions for the dates around which you’d like to go. The water will still be warm. You’ll also do well to take a boat to the famous Playa Negra, or Black Sand Beach. But incredibly, this isn’t even the most famous beach on the island of Vieques. That would be the Mosquito Bay, which has the brightest bioluminescent water in the world. Is it glowing again, post-hurricane? Yes. Go under a new moon. To get around, you can and should rent a bicycle, but there’s also a free trolley that will take you around San Juan, and to the national parks as well. Rincón, on the island’s western coast, is the top place for whale watching, but between December and March you can spot whales from San Juan’s Playa Escambron. In addition to being a good diving and snorkeling site, Escambron has a rather lovely trail running alongside for when you rent that bicycle. Broadly hyped in San Juan is La Factoria, which I figured out is the bar where they filmed Despacito after 70 people told me it was the bar where they filmed Despacito. I’d spent the hours preceding my visit to La Factoria drinking on a boat, drinking on a beach, drinking in the ocean, and then drinking on the same boat but going the other direction. By nightfall I was sunburned and salty and the only reason I dragged my bloated self to La Factoria for the same labor-intensive cocktails I could drink at home was a deep sense of professional obligation. Anyway, I was ignorant and wrong. This bar is fun! It wasn’t too crowded nor too pretentious, and rather than one big room you’ll find a slightly windy series of smaller ones; the deeper you go the more you get that cooling damp cave smell from the stone walls. Good cocktails. Good salsa. Try La Concha for a somewhat more Miami Beach vibe, if you’re feeling like a swimming-pool-in-the-middle-of-the-club kind of night. Leave wherever you are at midnight and partake in the La Noche de San Juan tradition -- throwing yourself backwards into the ocean with hundreds of strangers, and then continuing the party in the water. 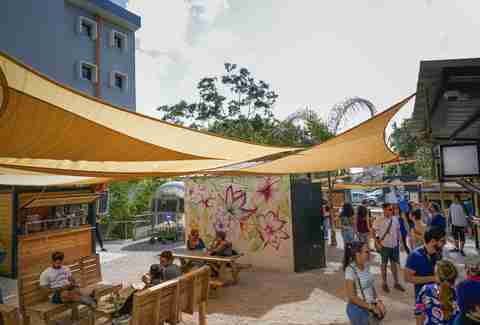 On your first night, dive straight into Lote 23, a multi-tiered collection of gastronomic kiosks and trailers that’s something between Smorgasburg and a food-truck court. Cristina, a co-founder, says “We have a lot of young chefs here, using Puerto Rican techniques mixed with all these other trends, all the products are sourced locally, we’re bringing in pop-up vendors and designers and local artists. You’re always going to be mind-blown here.” OK, so she’s probably not impartial, but she’s actually right. Feast on croquettes, fish tacos, and cocktails with fancy dried fruits -- and on your way out, grab a popsicle (mine was Nutella-stuffed strawberry) from the wildly popular Señor Paleta. The next day, when you inevitably want more ice cream, keep an eye out for roving ice cream cart vendors. A plastic cup with a few small scoops will probably run you $2 (but be a good citizen and make it $3) -- I chose coconut and ate it in Plaza de la Catedral while a photographer stood next to me on top of the bench shooting a wedding party at the convent-turned-hotel across the street. For the best traditional Puerto Rican food, my driver unreservedly endorsed El Jibarito, which he described as a place where the rich could pay with money or the poor by washing dishes, but where everyone goes one way or another. You were going to get mofongo somewhere, and that somewhere should be here. When you want to feel slightly posh, have dinner beachside at Oceano, where I would recommend just ordering as many seafood items for the table as your party might be able to take down, plus one more ceviche for good measure. If you’re still walking around Old San Juan then you’re also right by Barrachina, which claims to be the birthplace of the piña colada (as with most culinary origin stories, this is a matter of debate depending on whom you ask). I am really not a piña colada person, due to a pronounced dislike of rum drinks, sweet drinks, and drinks that cost more than $4, and ordinarily I wouldn’t recommend somewhere so blatantly touristy -- but friends, this piña colada is delicious. If you’re seeking something hearty to balance the upteenth piña colada you drank, find a tripleta truck, from the depths of which someone will hand you a sandwich containing nearly a pound of meat. And not far from San Juan is the small beach town of Piñones, which will become synonymous in your memory with snack shacks. 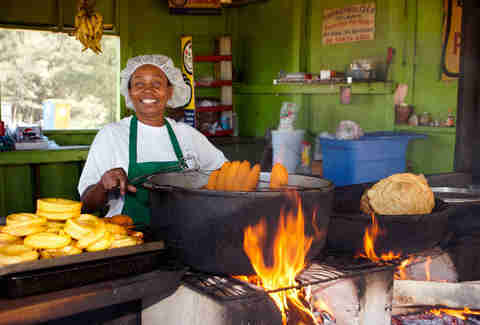 Arrive hungry and try as many frituras (fritters; fried stuff; stuffed things that are fried) as you can. I always feel like proximity to the sea is wasted on orders that aren’t seafood, but you’ll find chicken, beef, and pork options here too. Start with bacalaítos (salt cod fritters) or maybe alcapurrias (like a croquette, made from mashed plantains, taro root, and/or yucca), then find room for piononos (deep-fried, stuffed plantains) and canoas (kinda the same, but in canoe shape). You will want to consume these with a Medalla Light, the local beer that for Puerto Ricans occupies the emotional territory of, say, In-N-Out for Californians, or a Coney Island hot dog for New Yorkers. Glad you asked. Plan to tip the same way you would on the mainland. Except not, because you came here both because you wanted a good time and because you want your tourism dollars to go as far as possible. Add a bit extra to help set the locals back on their feet -- most things are so cheap anyway that a few percentage points will make very little difference to you or your budget. Legally, I must usually advise you to lay down a starchy base before drinking large quantities, but that is not conducive to the deeply sensible Puerto Rican pastime that is chinchorreo. For salsa you can go out to Palmas, at the end of Calle San Sebastian in Old San Juan. But you can also just… go out. Compared to the States, dancing in the street is much closer to the rule than the exception. It’s part of any good chinchorreo route, and wherever you find people and music, you will find salsa -- which explains how I ended up out till 5:30am dancing with strangers at what I’d originally taken to be a convenience store. What is La Placita, and should you go there? Many times in my life have I asked if a place is frequented by locals or by tourists and been assured that “it’s a mix.” Reader, it is never a mix. This is what your tour guide or cab driver or fancy hotel concierge says when they are about to offload you somewhere cringey where they themselves would never go unless they were paid to do so. But at the risk of greatly embarrassing myself, I do buy that on Friday nights, truly everyone goes to La Placita. It’s a dense concentration of everything you want in a street party, and it never closes. When I went there on a Sunday morning for the purpose of seeing who else went there on Sunday morning, it was sprinkled with predominately old Puerto Rican men catching up outside the food market, sitting with plastic cups of Medalla perched on their walkers in the way of old men who always meet at the same place.